For the last five years, Walter Gloshinski has been running a pizzeria out of the high school where he works in Newark, Ohio. Called Smiling With Hope Pizza, it serves what Gloshinski describes as classic New York pizza — but his operation isn’t really like other slice shops. 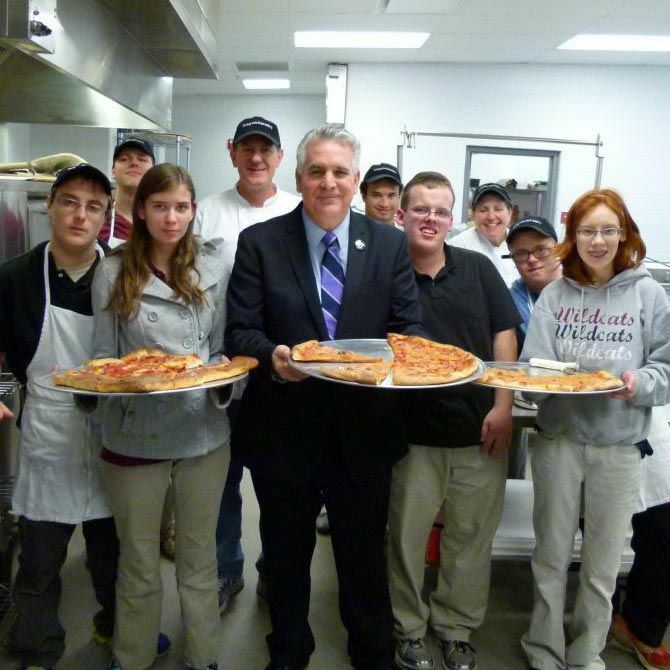 A special-education teacher for 25 years, Gloshinski staffs his pizzeria with his students — children with learning disabilities who are enrolled in the school’s special-education program. Now Gloshinski is packing up his bags for Reno, where he’s going to turn Smiling With Hope into a full-fledged restaurant and continue his mission of helping and employing people with learning disabilities. To that end, he’s launched a GoFundMe campaign to help make that happen. Grub spoke with him about how he started this program and what his plans are for the pizzeria. When did you first come up with the idea for Smiling With Hope? I started in Austin, Texas, 25 years ago. And it’s just been growing over the years. In Austin it was just a big metal bowl with a wooden spoon, full-blown gangsters in middle school, baking and selling brownies. They could buy a hamburger and didn’t fight as much. In California, I started with the bakery idea. I had a home oven in my classroom, so the pizzas were real small, but we were in downtown Santa Rosa. We walked out the door and had 100 clients, so we’d carry them around, push them in shopping carts. I was working with kids in gangs, Native Americans, Spanish-speaking kids. Their behavior got better; we made money and used it to buy them shoes, coats, meals. It was something most of those kids hadn’t experienced. I’m from New Jersey, and my mother is Italian. 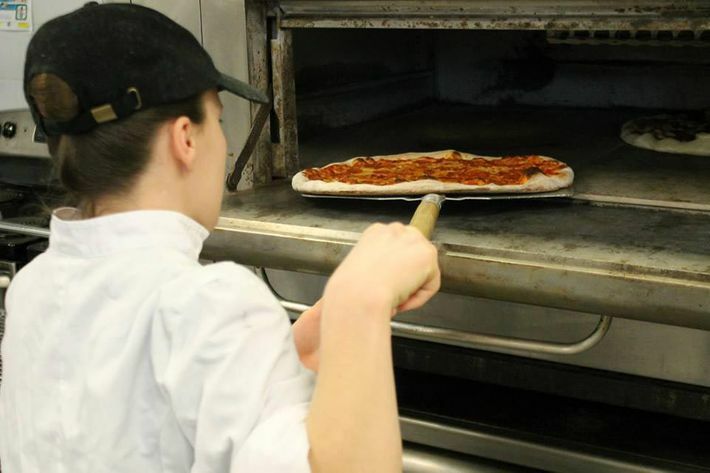 I made pizzas all my life and knew pizza would sell to everyone. When I got here in Newark, Ohio, I got this job and told them what I wanted to do. The special-education director said, “Okay, if you want to, go for it, but there’s no budget.” They gave me a home-ec room, and when they built a new high school I convinced them to give me a room. I got pizza ovens; we started going big. We started supplying two school districts with baked goods and selling breads, bagels, pastries, and pizzas to the public. That was about five years ago. It was all about doing something right for some people who never asked to be born the way they were. To be honest, since I’ve been doing this, my cause gets all the publicity, and my pizza gets some. 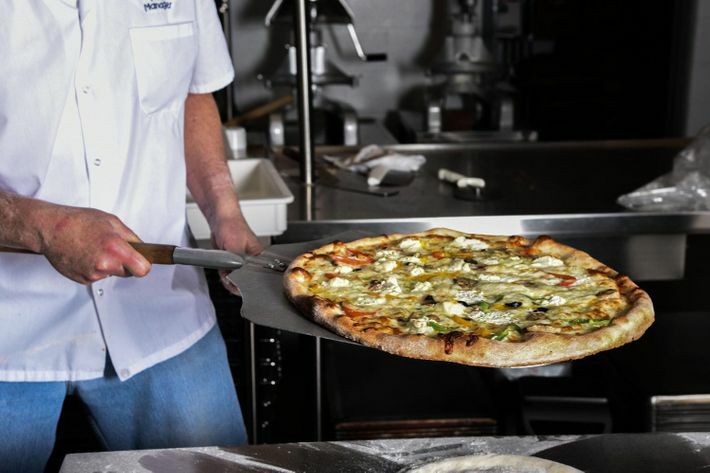 The cause is the main thing; the pizza is the vehicle to bring people in and make it happen. Why does this work for your students? We want kids sitting in seats, doing pencil-and-paper work. My approach is to create a real business, and it immediately opens every window and door to how to survive. That’s functional academics. Most of my students operate at the first- or third-grade level, and they are in high school. They are not going any further. Most sit in their seats, do first- or third-grade worksheets, and when they get out there’s almost 100 percent unemployment among them. I have five students employed. You know the food vendor Bon Appétit Management Company? They’re at Denison University. 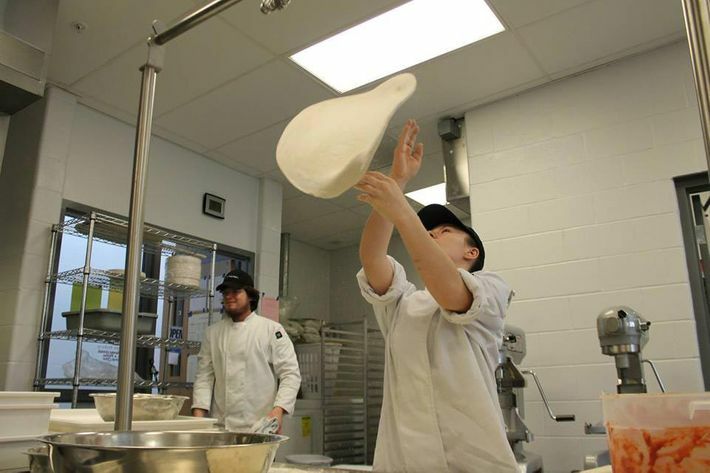 We’ve had a wonderful partnership; we supply them all kinds of artisan bread, and when my students get up to speed, they hire them at $10 an hour, which is unheard of here. I live in Appalachia, in a place where there’s deep, multigenerational white poverty. For these kids to get these jobs, it’s off the charts. I’ve gotten five kids jobs in five years, and that’s more than we produced in 25 years. And you’ve talked about how this gives a sense of purpose. In what way? Most of them have not known success in their lives. Their lives have been a failure. When they do this with me, they find success. Can you imagine living 18 years of your life and not finding success? We all want to work. If we lost work, we would lose meaning in our lives, and they’re no different. But you can count on 98 percent of them never getting a full-time job. Well, I think what’s additionally compelling is that you want to make good pizza with them, not just pizza. I’ll put my pizza up against any pizza in NYC. It’s world-class. It doesn’t take a lot to do that, but you need the right ingredients. I import my oregano on the stalk from Sicily. I import prosciutto from Parma, 600-day; we slice it by hand. I used Grande whole-milk mozzarella, ferment my dough in the fridge for days. My sausage is from my grandfather’s recipe. We debone pork shoulder, grind it. This is not a Domino’s with kids with special needs. My kids don’t make the pizza, but they can do the prep work. They can help with the dough; some ball the dough. I had one girl who was a savant. She could manage my two ovens, the original Frank Mastro from the 1960s. I have his oven, the Blodgett single deck. You know how pizzerias have to open the door and rotate pizzas? There’s no rotating with these. This girl Paige, she could run both. They run eight pizzas a deck, and she only stood eye-high to the top deck, about three inches above that. You can’t look into the deck — you’re launching with confidence, and she could do it without blinking an eye. Why are you moving Smiling With Hope to Reno? You make good pizza, you can go anywhere. I don’t know, when my feet itch I just go. We used to live in Sonoma County, and my wife lived in Reno when she was younger. We have a couple friends that have retired to Reno. I just said, “Sure, we’ll go.” There isn’t real New York pizza there, not the kind that I grew up with. What will this change? I know at the school you’ve already been responsible for paying all of the bills. I will work with the adult agencies that serve people with developmental disabilities and autism. I will pick who works here and who their job coaches are. We’re going to be a small place, only 1,200 square feet. I’m supposed to sign the lease this week. I may have three or four employees with special needs and use it as a training ground and place to bring awareness to what people with disabilities can do. Our shop will be a meeting place for people with special needs. We’ll have a wall of fame for Special Olympics medal winners. And, of course, you know, everyone who participates in the Special Olympics wins a medal. The point is the picture on the wall. And I’ll have a Sinatra picture up there and some of the other people that have done something to help this cause, yeah. There will be work from disabled artists; they’ll name the price, and we’ll give them 100 percent, no negotiations. So why’d you do the Kickstarter? We’ve got $40,000 going into this. That’s our life savings. I’m asking for $25,000 just to get us over the hump. When do you think you’ll be up and running in Reno? I’m pushing for December 1. It’s all restaurant-ready. No modifications. Everything is up to code — just need to get a walk-in cooler and the other things listed on my GoFundMe. I’ve been looking for two years, and this place, I found it on Craigslist. I’ve got four people in Reno who want to volunteer, [including] a chef here who is retiring and wants to help us get started. Where do you see Smiling With Hope going ultimately? We took in an 11-year-old undocumented girl who walked 1,000 miles from Mexico, barefoot, to get here. She is severely learning disabled, and long story short she moved in with us. Now she’s 28 or 29 and has worked at three pizzerias in Santa Rosa. Our dream is to get her up to Reno, have her work with us, and when Judy and I are too old to get the right people in place — accounting and whatever — give her the keys for a dollar. That’s the big goal for us on a personal level. It was a gift to have her in our life.